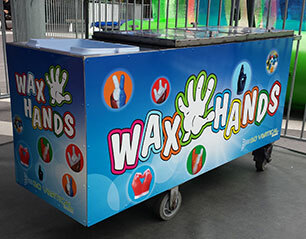 Wax Hands is an interactive experience that inspires the imagination and promotes creativity with all its participants. It’s simple to do; first your hand is placed in cold water, then molten wax. The mould is removed and coloured in your choice of colour. You can use either one unit or two units together. Go Vertical Events is the only company in New Zealand that has this unique piece of equipment.